Here in the Netherlands most people never heard of the awesomeness that is Peanut Butter Cookies. Ever since I found a recipe on Pinterest I have been in love with these cookies. 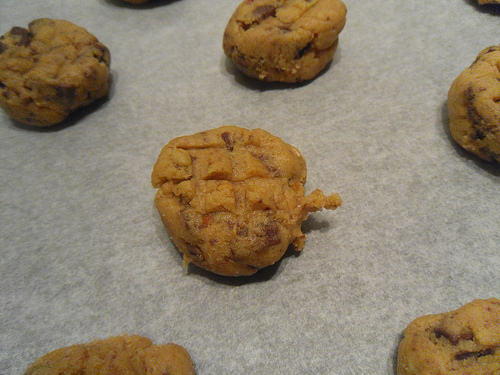 There is just something amazing about adding peanut butter to your cookies. 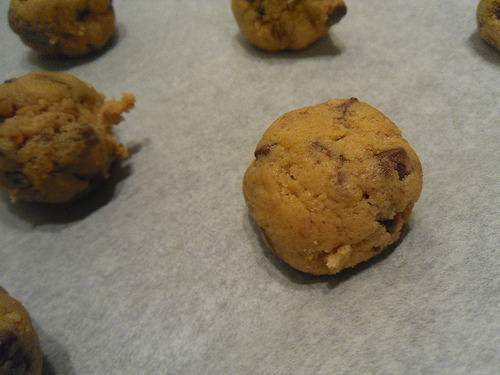 After a few tries I decided to add chocolate chips to my peanut butter cookies and that only improved them. The combination between sweet and salt is one of the things I love about these soft and chewy cookies. 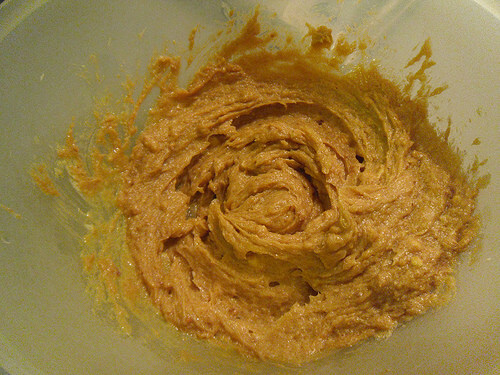 I also mix the dough with my hands as the original recipe I found mentioned you should mix it by hands, not sure if it actually makes them taste better, but I love using my hands on the dough it relaxes me. It’s also great for when you have some pent-up frustration or anger, nothing is better then hitting some dough with your hands, it’s therapeutic. 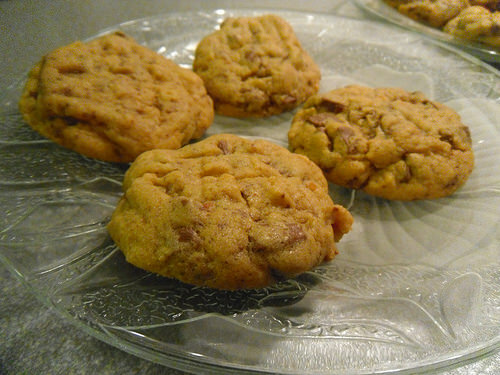 This recipe is based on the Soft and Chewy Peanut Butter Cookies recipe from Real Food Girl: Unmodified. I often just use more baking powder instead of baking soda and figured out if you use a bit more of that, they turn out fine. The chocolate chips are optional, but in my opinion adding chocolate really adds to these cookies. Once I made it with chocolate they didn’t taste quite as good without it. 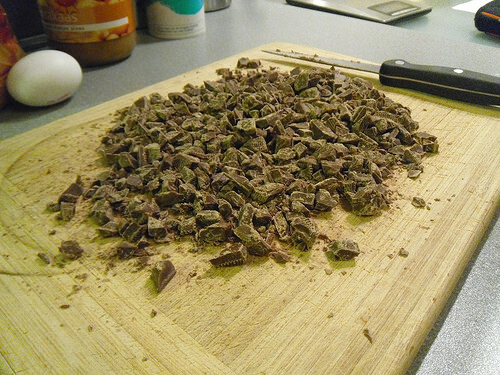 If you don’t have the luxury of chocolate chips, you can buy a bar and cut the chocolate into pieces yourself. 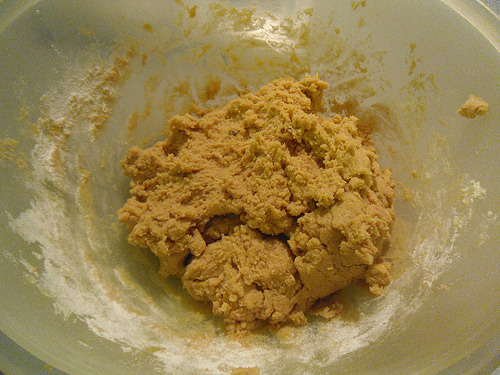 In a small bowl combine the flour, salt, baking soda and baking powder. Set aside. Warm the butter in the microwave for about 25-30 seconds, so it isn’t cold or make sure it’s on room temperature already. 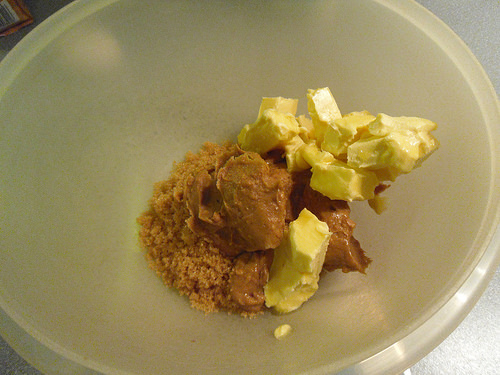 I like working with slightly melted butter as it’s easier to combine the ingredients then. 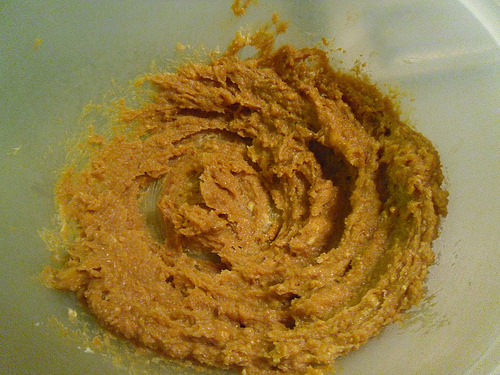 Combine the butter, peanut butter and sugars in a large bowl and mix with your hands till combined. Add the egg and stir well. Now start adding the dry ingredients. Work in thirds or fourths, add a bit, stir, then add more until all the flour is incorporated. 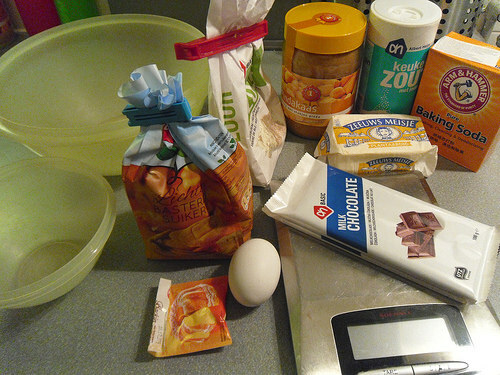 You can also just add al the dry ingredients at once, it makes mixing a bit easier, so that why adding portions works better. 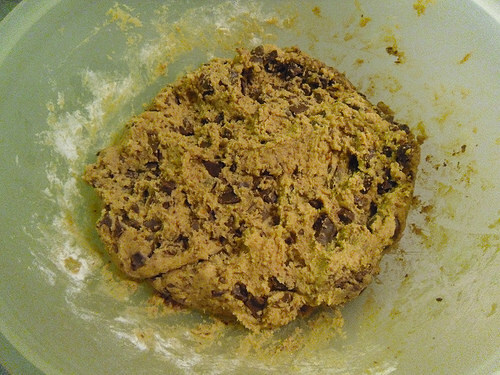 Add the chocolate chips to the dough and stir until well combined. 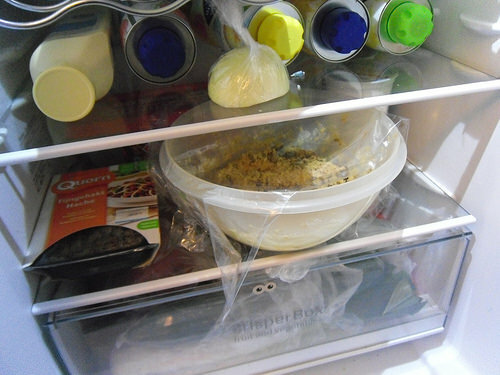 Put the dough in a Ziploc or cover the bowl and put it in the fridge for an hour or two. When the dough has refrigerated long enough, preheat the oven to 150 degrees Celsius/ 300 degrees Fahrenheit. 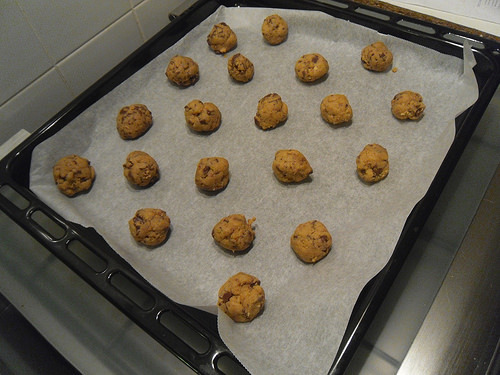 Then shape the dough into balls and put on a parchment paper covered baking sheet. Use a fork to make crisscross marks on the top (optional). Then put the cookies into the oven for around 10 minutes. Oh yum! I love peanut butter cookies. My favorite dessert combo is peanut butter and chocolate so even better! I’d not heard of mixing them by hand. Interesting. I do that now and again with recipes when the batter is too thick for a spatula. These cookies are good without the chocolate, but with chocolate they are even better. I just love the combination of peanut butter and chocolate, so yummy! The orignal recipe insisted you mix these by hand, so I still do, lol. I usually have to be in the mood for them, but I love that you add choc chips to it…I will have to try this recipe out…especially since I love baking. Such fun, and I have a huge sweet tooth so I might try it out this weekend. The chocolate chip addition is the best! It just adds something to the cookies and the combination of salt and sweet works really well. Hope you give it a try! I love baking as well and bake a few things every week, I just can’t go long without something sweet. Stop tempting me, lol !!! I haven’t eaten any yet, I think. I’ll have to come up with a recipe without eggs, but now that I’ve found peanut butter exists in my supermarket, I’d love to try 🙂 Thanks for sharing ! I am sorry for tempting you with these delicious cookies ;). Maybe you can use flax eggs instead of eggs? I follow a vegan blog who substitues egg for flax usually. Or maybe add some fluids like milk, water or soy milk instead? I hope you’ll give these cookies a try! MMmmm, my favorite! Peanut butter anything is really a winner for me, but PB cookies are even better! These look super tasty. I agree! I love peanut butter, but my favourite way to eat it is in cookies. Or as pasta sauce, yum! It’s been awhile since I last made these cookies, i really want to make them again soon! I love peanut butter cookies. It might be one of my favorite cookies to make. I made 25 dozen cookies a few years ago as gifts to give to my family. Each person got 2 dozen cookies in a nice box. I made oatmeal, peanut butter and chocolate chip. Same here! I just love peanut butter cookies! And that’s such a nice gesture to give everyone in your family cookies! I usually keep all the cookies I make for myself and my boyfriend, lol, but I did bake my boyfriends dad a batch of pecan oatmeal cookies for his last birthday. Yum! I love peanut butter cookies. I don’t bake because then I’ll eat them all. They are gone really fast here as well, although they usually last a day or two. Peanut butter and chocolate is such an amazing combination! Yum! 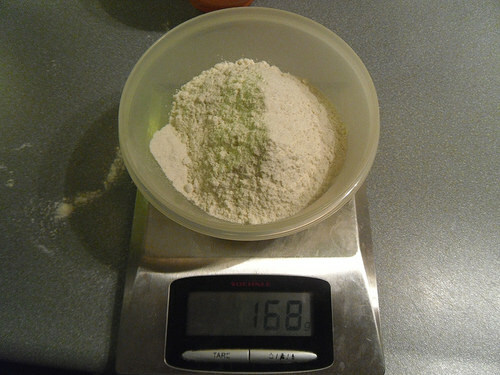 I love your pictures- its so cool seeing you weigh your measurements instead if scooping out cups like we do in the US. Would take some adjusting, but too cool LOL! For us it’s so normal to weigh everything, but cooking and baking in the US must look very different with all those cups and tablespoons to scoop things. It’s fun how these recipes posts also illustrate the differences in our countries! 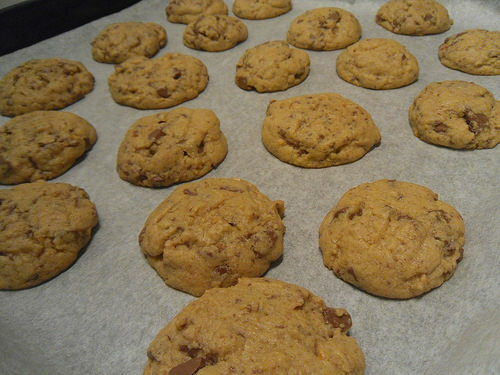 And the combination of peanut butter and chocolate is so good, will have to make these cookies again soon! By the way, I made your peanut pasta last night. It was DELICIOUS!! And my kids ate it! Yay! Well, two of them picked the peppers out but still… it was so good. Thanks so much for sharing your yummy recipes!